Brain, Digestion, Immune System, Naturopathic Medicine? Early in my practice I was so fortunate to learn about the importance of the body’s terrain, now commonly referred to as “THE MICROBIOME”, from my mentors in Naturopathic Medicine, the outstanding Dr. Gerard Guinot, Dr. Robert Abell, Dr. Dickson Thom and Dr. Mikhael Adams. 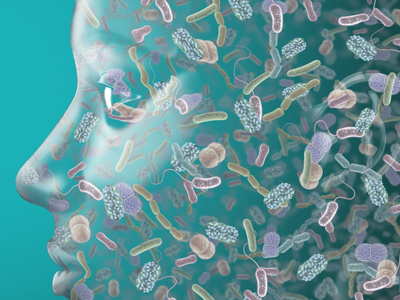 If you haven’t already heard, the next hot health topic is the microbiome, more specifically the gut microbiome. We are going to hear more about this and there will be plenty of studies proving that our body’s terrain is an essential component to excellent health and illness prevention. As a student, I first learned about the body’s ecology from one of my first professors in Naturopathic Medicine, Dr. Denis O’Hara, who introduced us to the teachings of one of the first Naturopathic Doctors, Dr. Henry Lindlahr. Dr. Lindlahr was talking about the microbiome way back in 1904!! He wrote about his findings in which the microbiome of his patients were being bathed in a milieu of their own toxic excretions, which Dr. O’Hara would affectionately translate as “drowning in their own crud.” This is as much of a problem now as it was then. Food quality, environmental pollution, medication, physiological toxicity and a myriad of other things changes our gut terrain, which is leading to disease in so many people. Moreover, the modern day focus on “killing germs” and germ phobia has decreased exposure, reduced tolerance to microbial diversity and limited immune development. This has become a big obstacle for health in adults and an even bigger obstacle for the health today’s children. This is not something that can be tested for in a lab, however when we build the terrain back up people feel better, their immune system gets stronger and physical symptoms disappear. I always strive to educate patients about the value of supporting a healthy gut environment through nutrition and treatment. Recently, I came across this video featuring Dr. Roynne Chutkan, an integrated gastroentrologist, that I had to share. She eloquently and succinctly speaks to the the health philosophy that I am so passionate about and integrate in my health educating. Time and time again, I have witnessed what my mentors and Dr. Chutkan have witnessed with regard to what it takes to live our healthiest lives. Take some time to learn more about how gut health, clean eating and exposure to bacterial diversity can help prevent adults and children from developing chronic illness by watching Dr. Chutkan’s video. For more information or to learn what you can do to strengthen the foundation of your health feel free to email me at drlaura@winhealth.ca.